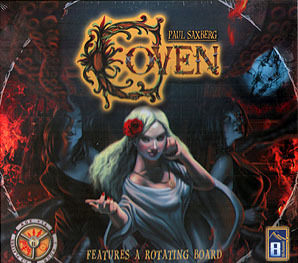 Coven is an Award Winning game of secret alignments for 3-5 players in which each player represents a Witch serving either the darkness or the light. Not only is your starting alignment a secret, but each of the five non-player Goddesses has an unknown alignment as well. Gameplay is deceptively simple, with five possible actions as players traverse a circular board with an inner rotating pentagram, changing tactics with each rotation. Coven presents an interesting strategic challenge: the side (Light or Dark) that score the most Balance defeats the opposing side - but on the dominating side, only the Witch that scores the most Favour can win, so players must be careful not to invest too much in one while neglecting the other. Coven includes fifteen playable characters - three of each class - Earth, Water, Spirit, Air and Fire. It also includes a Goddess Favour/Balance board, five miniatures, 100 magic crystals, 10 hidden alignment tokens, "reversal" tokens for players who dare to change sides, Artifact, Balance and Hex Cards, and a two piece circular playing board with a rotating centrepiece.